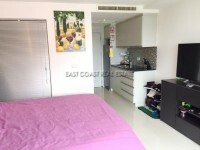 This brand new 1 bedroom unit is for SALE at ‘Arcadia Beach Resort’. It is on 6th floor with pool views and comes fully furnished with built-in European kitchen, living area with sofa, dining table set, flat screen TV, and queen sized bedroom with built-in closet. Quality fitted bathroom with hot water shower. Air-conditioning throughout and pool view balcony. This project is located at Thappraya Road Soi 9, South Pattaya - in the heart of Pattaya’s most central suburban residential area. It comprises a selection of 4 buildings with an array of leisure, entertainment and commercial amenities associated with prime beachside holiday resorts. For SALE under Foreign ownership with transfer & tax fees are split 50/50 between the seller and the buyer.